Yes! The BCS is back! - if only in tailgate form. This year we'll be "food (& drink) ifying" the BCS with *Beer* *Chocolate* & *Steak* with a selection of yummies including (but not limited to): teriyaki steak kabobs; beer & chocolate banana bread; beer & cheese soup; chocolate mixed nuts brittle bars; beer; and, hot chocolate, and maybe some more chocolate. Penn State celebrates Senior Day sparring with the spartans of michgian state. Kick-off is at 3:30pm so the parking lots will open at 8am. We'll be there bright and early and setting up around 9am. Come on over and join us for a beer (& some chocolate) or more - we'll be in the Green (Press Box/West side) Lot - contact us if you need more specific directions. The current forecast is for cold... and breezy (yay! my favorite!) with possible drizzle/rain in the evening (booooooooo!) - so wear layers and bring some rain resistant/proof gear, but make sure it's Blue and White because msu... wears green... wears white. 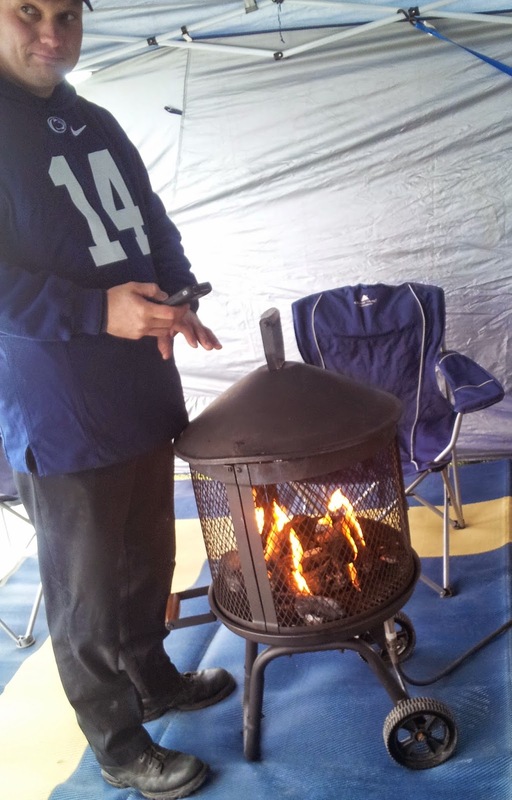 And do not fear - the fire pit will be near.